Founded in 2014, ForexChief is an offshore broker licensed by the Vanuatu Financial Services Commission as a securities dealer. It has offices in Singapore and Moscow and offers trading on the Forex and precious metals markets on the MetaTrader 4 platform. The registration process for Forex and binary brokers is simplified and much cheaper. The company guarantees the utmost security of client’s funds by means of a special mechanism of separating client’s account funds and internal funds in bank accounts. ForexChief offers its customers 2 types of accounts free of charge operation: MT4.Classic + and cent-MT4.Classic +. Also there are 2 types of accounts that have a commission, but provide lower spreads (from 0 points) – MT4.DirectFX and cent-MT4. DirectFX. All types of accounts provide a credit leveraging of up to 1: 400, the micro lots trading and a minimum deposit of 1USD. The owner of any account may copy trade patterns of successful traders and/or sell their own trading signals. Like most brokers, ForexChief is based on the most popular MetaTrader4 (MT4) platform for trading, available in both desktop and mobile modes. The terminal has earned a good reputation for its user-friendly interface and various useful functions that allow traders not only to perform successful transactions, but also to analyze market dynamics, automate their transactions with assistance from a wide range of experts and test their strategies. The broker charges a welcome bonus of 20USD for no deposit accounts. 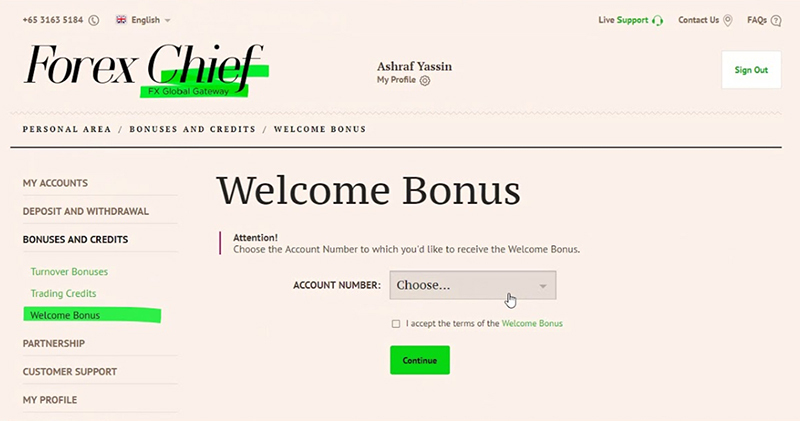 The bonus can be withdrawn without restriction after performing the first trade turnover. ForexChief Ltd provides its traders with the opportunity to earn additional income by participating in the White Label and Ib Pro affiliate programs. ForexChief offers its customers several ways of depositing and withdrawing funds: bank transfer, credit / debit card, Skrill, WebMoney, Yandex.Money and Qiwi e-wallets. Feedback on the work of the broker is mostly positive. Traders emphasize small spreads, easy commissions, quick triggering of transactions, no problems with withdrawal of funds. However, there are also negative aspects of working on this platform. There are quite a few complaints about intrusive calls from company managers, recently the server often freezes and there are frequent failures when charging bonuses to the customers. Good variant for a beginner. I decided to trade after my friend left the work in office and prefered make money trading. I knew that this is a really working way to make money, but I didnt know how to start. But now I started to earn first money, thanks to the education programm from this broker. I finished a course, then tried a demo account, and after — opened a real one. I ve heard about a low spred here and that was the key reason I deposited. Thank God I succeded. What I like the most is correct pricing and very very low spred, yes, it is true. Good platform for online trading and for everyone who prefers using phones. Mob app is great! I’ve managed to haul a couple of huge pips this weekend using this platform, and I’m greatly pleased with the interface. A rare service offers such a good choice of functions for advanced traders. All news are correct. I also like the mobile access and fast execution that allows working anywhere you want. I think I found the best place for trading.